Jackdaws are a family of medium to large-sized birds from the crow-family. 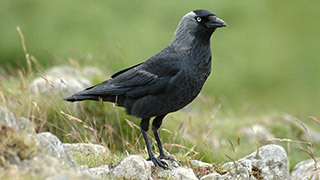 The western jackdaw is found across Europe, the western regions of Asia and North Africa. The Daurian jackdaw is found from the eastern parts of Europe up to Japan. During winter time, populations in colder environments tend to migrate south. The western jackdaw consists of four subspecies, each having slight differences in plumage.